While it's a little disturbing to imagine Kermit and Miss Piggy in the kind of provocative pose that Daniel Craig and Rooney Mara struck in the actual Dragon Tattoo poster, it's also hilarious. I don't think the actual Muppets movie involves any parody or in-jokes about current movies in release, but the marketing campaign has managed to get everybody talking while showing off the bare minimum of footage from the film. 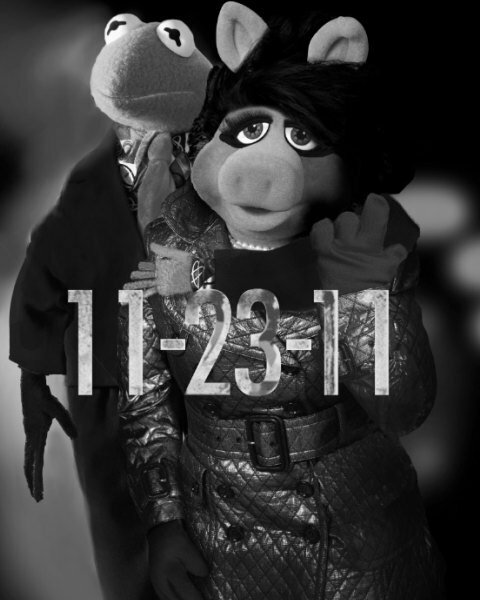 It's a great way to remind everyone of the sharp Muppets sense of humor while also keeping the movie relatively under wraps. Though, lucky for us, it won't be under wraps a whole lot longer-- the movie finally comes out in just over two months, on November 23.